Take flour, add 2 teaspoon oil, grated chocolate, and knead dough. Take another bowl and mix sugar and oats into it. Make small balls and deep it into the oats so that oats and sugar sticks to the ball. Roll small puris of about 2 inch diameter from it. Spread it separately on the paper or muslin cloth. Prepare all the puris. Take oil in frying pan and deep fry all the puris. Start frying in batches after all the puris are rolled so that it gives some time for drying. Fry it on medium flame. The puris then will turn out to be crispy. Don't put too many puris in frying pan otherwise it will not become crispy. Drain it and put it on the paper napkin separately to remove excess oil. Let it cool completely. 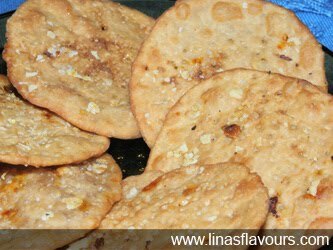 You can store this puris for about 8-10 days.